Presented in a small diary format with thick paper stock. Lucy has just turned 30 and is single. Surrounded by a circle of married friends or ones starting families, she feels alone and hopeless. Determined to find "Mr. 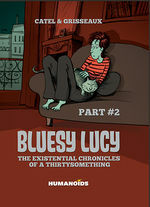 Right," Lucy begins evaluating different suitors to various degrees of success and absurdity. 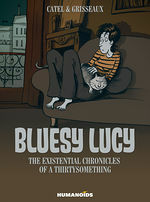 Creators Catel ("Kiki de Montparnasse") and Veronique Grisseaux paint a touching, humoristic, and realistic picture of what it is to be a young, independent…and sometimes lost…woman in today’s modern world. This is less a book about a woman finding a man than it is a woman finding herself and putting her romantic life in proper proportion to her whole life. The creators give Lucy an agency to negotiate her own failures and determine her own outcomes not found in the genre, that the moments of self-realization and awareness she experiences hold greater resonance and significance.